Shasta Mosquito and Vector Control performs annual surveillance for Ixodes pacifcus and Dermacentor sp. ticks, attempting to establish abundance trends, and provide residents with areas of heightened public concern. Ticks have the potential to vector such diseases as Lyme disease, Anaplasmosis, Babesiosis, Ehrlichiosis, Rocky Mountain Spotted Fever, and Tick-borne relapsing fever. There are a few common species within the District. Western black legged tick (Ixodes pacificus) populations are regularly tested for infectious agents. 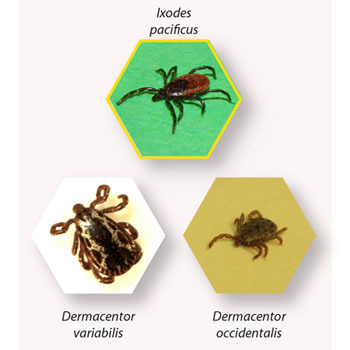 American dog tick (Demacentor occidentalis) and Pacific Coast tick (Dermacentor variabilis) are not currently known to vector any disease within the District. Lyme Disease is known to be transmitted in Shasta County. District staff routinely find Borrelia burgdorferi, the bacterium responsible for Lyme Disease, in area-collected ticks as part of their tick surveillance program. To find out more about the current tick population in the District, please visit our vector population page.